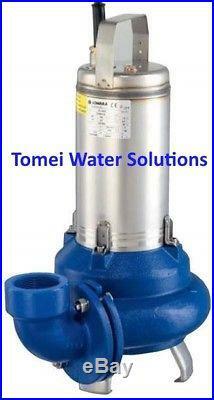 Lowara DL Submersible Pumps for pumping sewag DLVM100/A 1,1KW 1,5HP 1x230V 50HZ. 0,6 kW to 1,5 kW rated power. Solids handled up to 50 mm in diameter. APPLICATIONS Pumping of sewage with suspended solids and filaments. Emptying of sumps, septic tanks and wastewater discharge tanks. Draining of flooded excavations and marshy ground. SPECIFICATIONS Maximum liquid temperature: - 50°C with fully submerged pump. 25°C with partially submerged pump. Mechanical seal protected by sand labyrinth. Maximum dimension of suspended solids: - 45 mm for DL80, DL90, DL105, MINIVORTEX, VORTEX. 50 mm for DL109, DL125, DLV100, DLV115. Motor in a dielectric non-toxic oil bath, which ensures the lubrification of the ball bearings and a more efficient cooling. Maximum immersion depth: 5 m. Versions: - Single-phase: 220-240V, 50Hz 2 poles. Three-phase: 220-240V, 50Hz 2 poles. The single-phase versions feature: - capacitor housed in a box on the power cord + 1,5 m. Thermal overload protection to stop pump supply in case of overheating. CG versions (single-phase with pre-assembled float switch), 60 Hz single-phase and three-phase versions, with various power cord lengths and various plugs are available on request. LOWARA 107560120 DL DLVM100/A 1,1KW 1,5HP 1x230V 50Hz. LOWARA DL Series Submersible Electric Pumps for pumping sewage. Single-phase pump WITHOUT float switch. The item "Heavy duty submersible dirty flood sewage water pump DLVM100 1,5HP240V Lowara DL" is in sale since Wednesday, December 12, 2018. This item is in the category "Garden & Patio\Ponds & Water Features\Pond & Fountain Pumps".